In my first college anatomy class, the professor claimed that by adulthood, the three or four bones of the coccyx typically fuse into one rigid segment. But, several well-designed studies since then have shown that in a normal functioning coccyx, there should be two or three movable parts that gently curve forward and slightly flex as we sit. Although none of the individual abnormalities above always caused pain, participants were more likely to experience coccyx problems when several of these conditions were co-present. 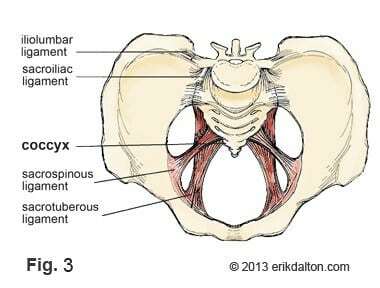 Buttock pain may develop as spastic hip muscles and injured sacrotuberous, sacrospinous and sacrococcygeal ligaments anteriorly flex (hook) the coccyx and compress/overstretch the sensitive filum terminale (Fig. 1). 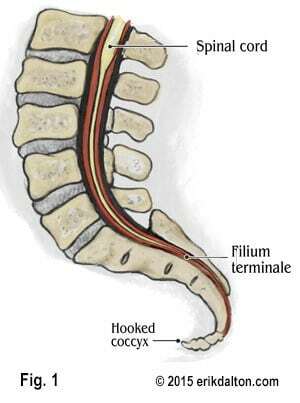 Falling on the tailbone or child birthing can also lead to coccygeal pain, known as coccydynia. Injuries such as these may cause inflammation, which triggers the growth of bony osteoarthritic spurs in and around the sacrococcygeal joint. In the case of a rigid coccyx, tissues under the inferior segments sometimes develop a pad of irritated tissue (like a bunion) that rubs the dura raw. But, by far, the most common problem I treat in clinic is buttock pain co-present with an exquisitely tender coccyx, typically caused by a hooked and/or sidebent coccyx. Persistent tensioning of the filum terminale may create adverse dural tension as the displaced coccyx drags on the spinal cord and lumbosacral nerve roots (Fig. 2). Accompanying protective spasm in surrounding hip muscles and inhibition of the levator ani and other pelvic floor muscles is also a common finding. Long-term dural tractioning and/or compression frequently manifest as buttock spasm and pain, and are commonly misinterpreted as gluteal or piriformis trigger points. This is but one reason therapists will greatly benefit from the ability to recognize and treat nerve and dural membrane disorders. Due to the vertebra’s direct attachment to the dural membrane through the filum terminale, coccyx work can cause a client to become very emotional. 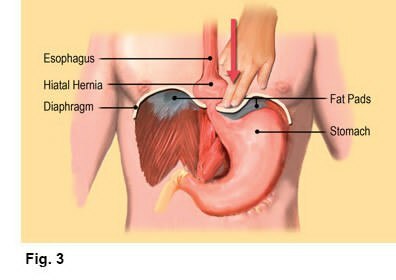 Please be aware of physical and emotional hypersensitivity before assessing and treating coccyx disorders. Carefully explain what you intend to do and ask the client’s permission. All coccyx alignment techniques should be performed through underwear or draping. Please see accompanying “hooked coccyx” technique video here. Postacchini F, Massobrio M, Idiopathic coccydynia. Analysis of fifty-one operative cases and a radiographic study of the normal coccyx. The Journal of Bone and Joint Surgery. 1983 65(8): 1116-1124. Kim NH; Suk KS: Clinical and radiological differences between traumatic and idiopathic coccygodynia.